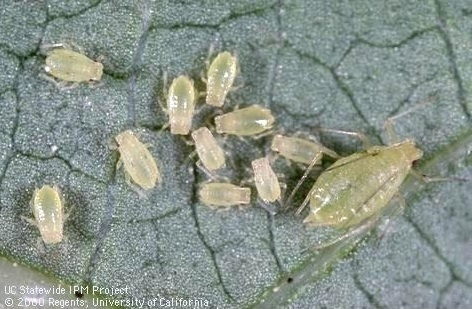 Different species of aphids infest celery and celeriac crops in California. The black bean aphid, Aphis fabae, the foxglove aphid, Aulacorthum solani, the green peach aphid, Myzus persicae, the hawthorn or parsley aphid, Dysaphis apiifolia, and the cotton/melon aphid, Aphis gossypii are among the aphids that could cause damage. Damage includes distorted or stunted plant growth at high numbers, vectoring viral diseases, and contamination of the produce with honeydew secretion and debris. 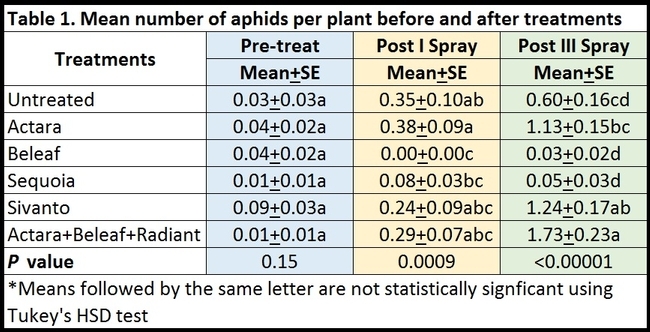 A study was conducted at Babe Farms, Santa Maria to evaluate the efficacy of various chemical pesticides against aphids. Field was planted in celeriac variety Brilliant on 15 June, 2016. Treatments included i) untreated control, ii) Actara 4 oz/ac, Beleaf 50 SG 2.8 oz/ac, iii) Sequoia 4.5 fl oz/ac, v) Sivanto 200 SL 14 fl oz/ac, and vi) Actara 4 oz + Beleaf 2.8 oz + Radiant SC 8 fl oz/ac as the grower standard. Induce was used as a surfactant at 0.25% vol/vol rate. Treatments were administered on 14 and 25 July and 6 August in 80 gallons/acre of spray volume using a standard spray equipment. Each treatment had eight 38” wide and 100' long beds that were replicated four times and arranged in a randomized complete block design. Pre-treatment aphid counts were taken on 13 July and post-treatment counts were taken on 22 and 29 July and 9 August, 2016. On each observation date, 20 random plants from the middle two rows of each plot were gently beaten with the lid of a plastic container and aphids dislodged into the container were recorded. Data were analyzed using Analysis of Variance model in Statistix software and significant means were separated using Tukey's HSD test. Only green peach aphids were seen on celeriac during the study. Their numbers were very low and uniform (P = 0.15) before the treatments were initiated (Table 1). 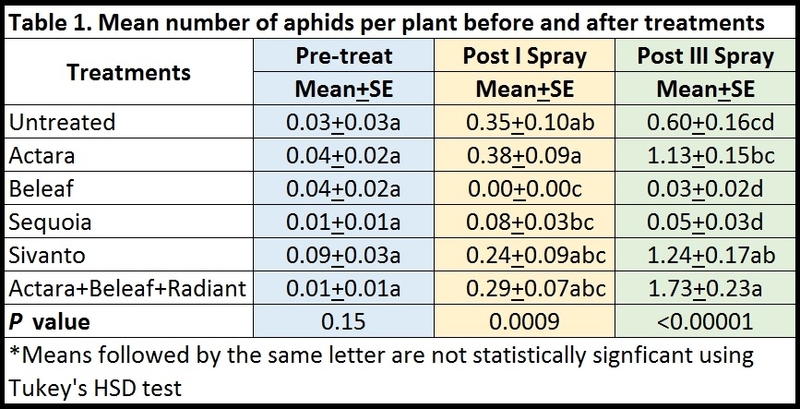 After the first spray, there were no aphids in plots treated with Beleaf and it was significantly lower (P =0.0009) than untreated control and Actara treatment. 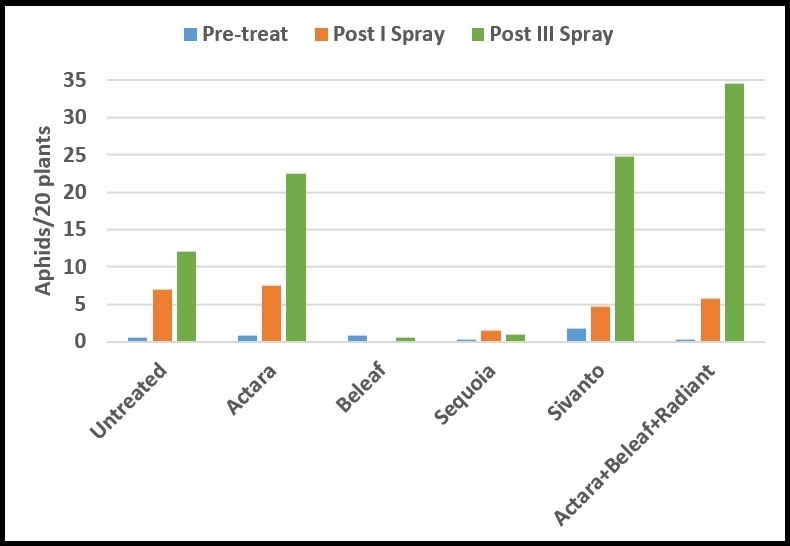 Sequoia was the next best treatment, but it had significantly lower aphids than Actara treatment. Due to a sampling error, data collected after the second spray were excluded from the study. 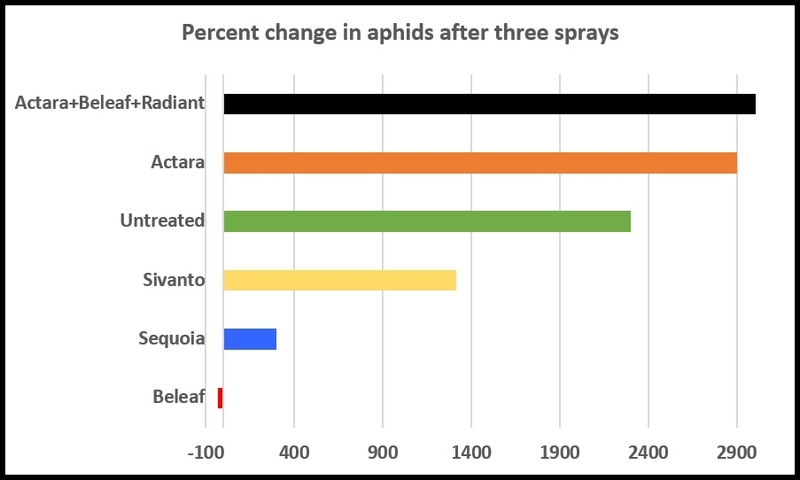 After the third spray, aphid numbers declined only in plots treated with Beleaf and Sequoia and increased at varying degrees in other treatments. 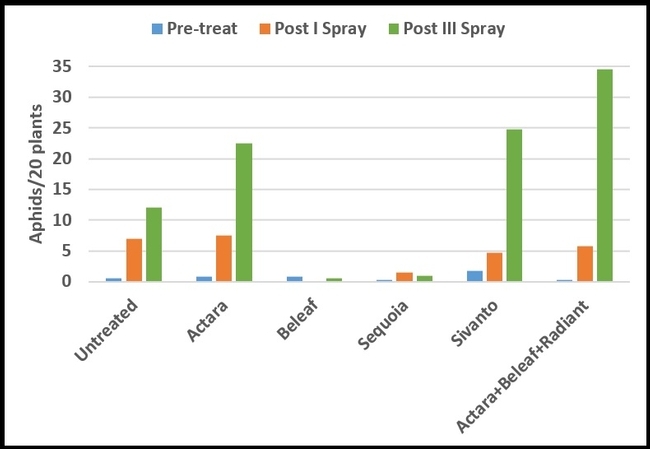 Significantly lower (P < 0.00001) number of aphids were present in Beleaf and Sequoia than Actara, Sivanto, and Actara+Beleaf+Radiant treatments. Combination of different chemicals appeared to perform worse than some of the chemicals that were applied independently. When percent change in aphid numbers from pre-treatment counts to the counts after the third spray were compared, Beleaf was the only treatment that caused a 33% reduction. Sequoia treatment limited the population build up to a minimum level compared to the rest of the treatments. This study demonstrated the efficacy of different chemical pesticides against green peach aphid in celeriac. It was not clear why the combination of some chemicals failed to bring down aphid populations, but results warrant caution while choosing compounds for tank mixes. It is important to avoid repeated use of the best chemical compounds to reduce the risk of resistance development. Select some of the effective chemicals and use them in combination or rotation with botanical and microbial pesticides. Regular monitoring, adopting cultural practices that might reduce pest populations, conservation of biological control agents, and timely application of botanical, microbial, and chemical pesticides, and other appropriate measures are critical components of a sound integrated pest management program. This study was originally designed for evaluating the efficacy of chemical pesticides against the western tarnished plant bug (lygus bug), Lygus hesperus, which is becoming a problem in vegetable crops such as lettuce, celery, and celeriac. Random sampling in some areas of the field, prior to the initiation of the study, showed a few western tarnished bugs, but due to their negligible numbers thereafter, meaningful results could not be obtained from the study. Acknowledgements: Thanks to Jason Gamble, Babe Farms, Santa Maria for his collaboration, Bayer CropSciences, Dow AgroSciences, FMC, and Syngenta for the support of the study, and Tamas Zold and Danielle Cadena for the technical assistance.